I remember taking keyboarding in 7th grade and then again in 10th grade (slow learner). I learned to type at about 40 wpm. It is a skill that has been incredibly useful through my life of high school, college, doctoral studies, and into the rest of my life. If I have ideas, I can easily express them as my fingertips blaze the keys on my MacBook Air. I don't have to think about it. I just think of the words that I want to write and my fingers click out those words without me even thinking about it. My attention is on the words, NOT the keyboarding. Unfortunately, a number of schools have decided not to teach keyboarding. They figure that students are learning how to keyboard by themselves so they don't need to know how to hit the keys automatically. This means that they don't learn the placement of the keys on the keyboard and they have to really think about which keys to hit to enter the letters they want. Students will be expected to exhibit their writing using a computer. I don't know how they are divided, but they will be allotted 120 minutes to complete the Language/Writing test. Students will be expected to write their stories/essays on their computer. This means that they need to organize their thoughts and then tap the proper keys to create words on the screen. Students who type less than 15 Words Per Minute (WPM) will have a problem. (15 WPM is 75 letters which is a little faster than 1 key per second.) . Unfortunately, they will spend more time worrying about tapping the keys than creatively (and correctly) expressing themselves. This is a problem!!! I PREDICT THAT STUDENTS' WRITING SCORES WILL DROP DRAMATICALLY!!!!! 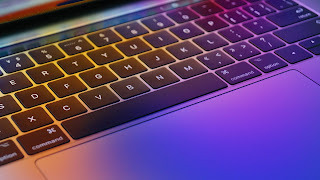 A few years ago, Sunburst Digital found my blog - Keyboarding Research and contacted me about working with them on developing their Type 2 Learn program. This has been a successful tool for teaching typing but they wanted to enforce it through a research approach. They hired me to consult with them on refining their program and then writing a white paper about the best ways to teach keyboarding so that they could share this with their customers and highlight how Type 2 Learn followed these findings. More recently, Sunburst Digital asked me to update the research. They shared it on their website, but I have had educators ask me about this research so I decided to share it on my blog. You will notice that Type 2 Learn is emphasized throughout. It is a wonderful program, but if you don't use Type 2 Learn, the research can still be valuable. 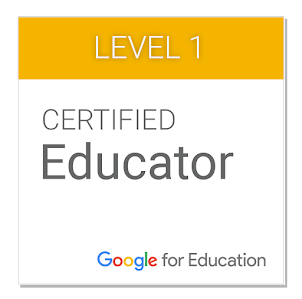 I hope that it can inform how you and your schools are addressing this necessary skill. I will be interested to see how the writing scores fare in Iowa this year. I hope that I will be able to make another posting in the future to say that the Iowa writing scores are in great shape, but I don't count on it. 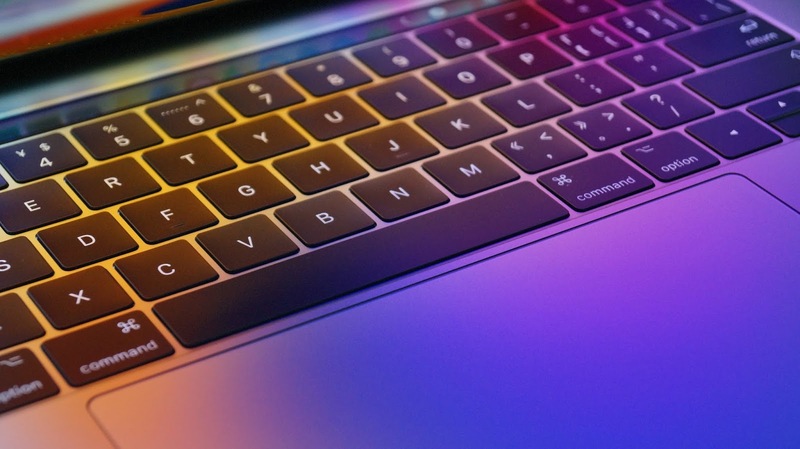 I look forward to hearing from you about your experiences and opinions on this so leave some comments about how keyboarding is handled in your schools. #GivingTuesday Fund Drive is Successful for WOW!!! We just wanted to thank you for supporting Write Our World yesterday on #GivingTuesday. We had 32 donors and raised over $1800. We almost made it into the top 20 fundraisers for yesterday (we were #21). They donated an extra $100 to those in the top 20. The drive is not over. Our goal for December 31, 2018, is $5000. You can still donate through our Write Our World Global Giving website. Have you ever thought about becoming a sustaining supporter who donates the same amount each month? training for teachers in how to integrate creating multilingual ebooks into their curriculum. access to the library for classrooms of writers. support for maintaining and improving Write Our World. We are making a difference in students' lives - - - - YOU can too!! If you are reading my blog, you are probably a person who has spent (or will spend) most of your life working with people and making the world a better place. 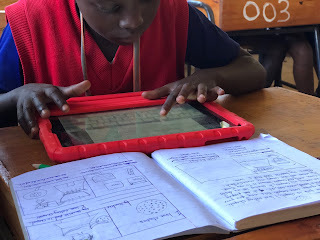 I am writing today to ask you to support an important online library that enables kids to share their ideas and connect with others. It is Write Our World. You have heard me talk or seen me present about this program. I first heard about Write Our World at the 2016 ISTE conference in Denver. I realized that Write Our World was an opportunity for recognizing children’s stories and reflecting their personal multicultural experience by sharing their tales in English as well as their native languages. A year later, I was asked to join their board and now am working with Write Our World to make a difference in the world. This is beyond being a professor at UNI. This is what I am doing to help kids around the world. Write Our World is . . .
We are a startup non-profit organization. Presently we operate with a handful of staff and volunteers. We want to make a greater difference in the world so we are running a fundraising drive to raise $10,000 over the next 5 weeks. Write Our World is participating in the Global Giving Accelerator Program from November 27th-December 31st. We need your support to help bring this writing opportunity to more children around the world. Tuesday, November 27th is #Givingtuesday. This is the day when Global Giving will match whatever you donate. It’s not necessarily a 100% match but will add to Write Our World donations. All funds raised on November 27th will increase our chances of getting additional matching funds and bonus donations in the future. Every donation helps refugees, immigrants, indigenous and multilingual youth feel empowered and lets their voices be heard! Click Here to make your donation on Tuesday. Share Your Wealth on Tuesday. The Kids of the World will thank you. 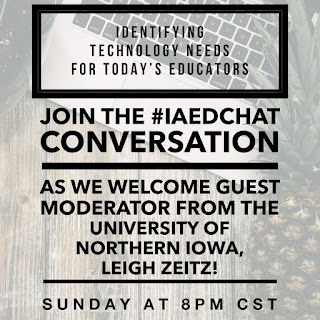 One of my personal favorite chats is #iaedchat. This Twitter chat meets every Sunday night at 8:00 pm Central Time. We have Iowa educators, but you will find chatters from all over the country and even throughout the world. 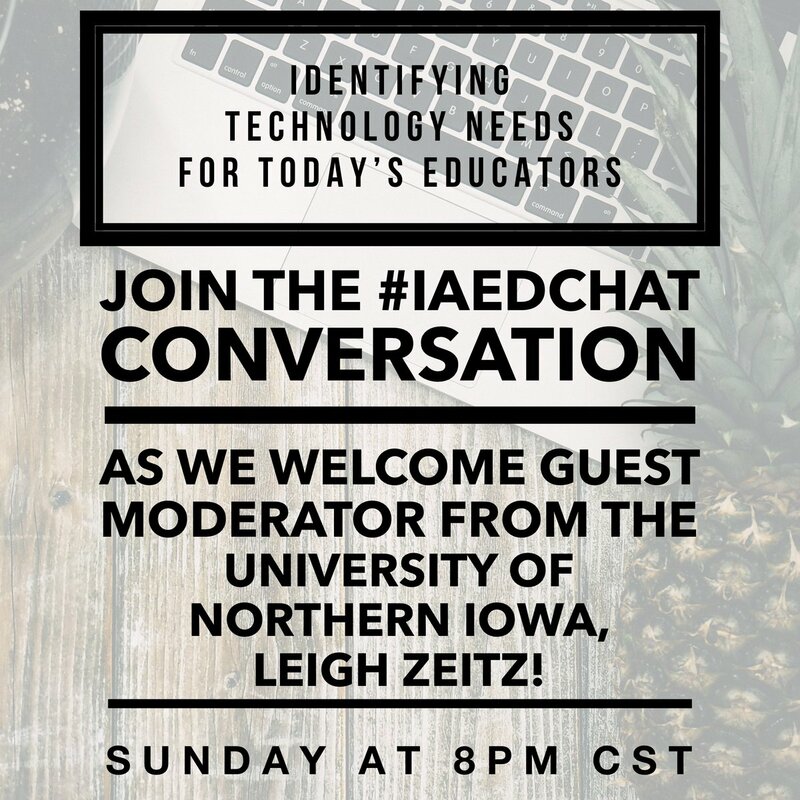 I am inviting some of my EdTech Minor students to join the #iaedchat chat on Sunday and it has inspired me to provide some direction for "getting the most" out of Twitter Chatting. Select Your Tool: EDITING NOTE: Originally I had recommended tchat.io. Since then I have had problems with that tool so now I am recommending TweetChat.com Tweetchat is simple. Enter the hashtag on the opening page (e.g., #iaedchat ) Log in using your twitter account. This leads you to a page for your conversation. Enter your tweets in the text box. Remember to click the "Start Stream" button to begin watching the chat. Here is a 3-minute video on how to use TweetChat. If you want to make your own selection, here is a recent listing of the 5 Best Tools for Twitter Chats. Show Up Early: Even if it is only 5 minutes, get settled before the chat because the pace can get rather fast and furious. Share Your Intro; Be prepared to introduce yourself at the beginning. This is where we can learn about the location, profession, and grade level of the participants. Answer as Much as You Want: You don't have to contribute lots of answers. You can lurk throughout the whole thing but you won't get much out of it. Aim to post at least 4 answers throughout the hour-long chat. You are welcome to talk as much as you want, but placing a minimum will ensure that you at least dip your toe into the flood of genius that will flow across your screen. Reduce the Stress: If there are lots of chatters, the discussion can zoom past you. You can feel overwhelmed because you don't have time to read all of the posts. You can take control of this by just identifying 3 or 4 chatters who are interesting. Just follow their postings and respond when you have something to say. Most Twitter chats have archives so you can go back and read the other postings at a later date. Follow Them: If a chatter looks interesting, click on his/her/their name to visit his/her/their Twitter page. This will show you more about him/her/them and give you a chance to click the FOLLOW button. Remove the Retweets: You will see some Retweets in the chat. These add more lines for you to read. The Tchat.io software allows you to Hide Retweets. Click this button and you will see each posting only once. Have Fun: This is an opportunity to meet other people and learn other's opinions. Enjoy it and make your contacts. Follow up: This is a great opportunity to make connections. If you liked what one chatter was doing in the classroom, contact him/her/them later to further discuss the topic, set up a classroom collaboration, or even schedule a meet-up face-to-face or virtually. If you learned something from leaders in schools, and you think that you might like to work in those schools. Make the connection and begin the conversation. Twitter Chatting is an easy and fruitful way to make connections with like-minded people. I hope that I have a chance to connect with you through a chat some day. Until that day, perhaps you could leave some comments about what I have written or maybe in answer to some of these queries . 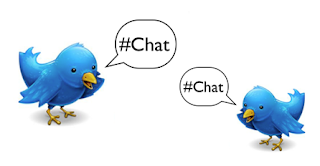 . .
What is YOUR favorite Twitter Chat tool? Which chats do you recommend? What other suggestions do you have for successful chatting? Share a Twitter Chat story about what you learned or who you met.